Pupitar in game: 894 Who? Important notice! Pokemon Pupitar is a fictional character of humans. 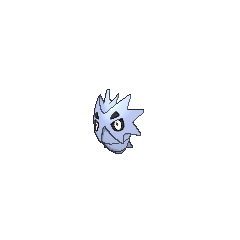 Pupitar (Japanese: サナギラス Sanagiras) is a dual-type Rock/Ground Pokémon introduced in Generation II. It evolves from Larvitar starting at level 30 and evolves into Tyranitar starting at level 55. 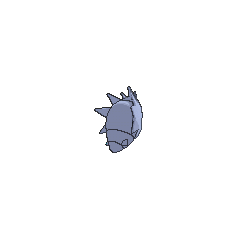 Pupitar is encased inside a thick shell made of grayish-blue rock. Its red eyes can be seen through two holes in the shell, and two more holes directly above resemble eyebrows. 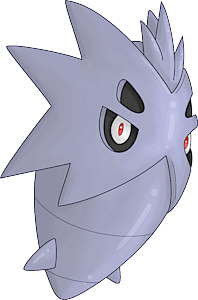 The upper portion of its body is covered by a mask-like plate with four large spikes on either side. Three additional spikes protrude from its forehead. While its arms and legs are developing inside the shell, Pupitar is capable of venting gas to propel itself around, and can generate enough force to knock down mountains. Pupitar lives and moves freely around harsh mountain ranges. Ritchie has a Pupitar named Cruise which is seen from The Mystery is History! to A Promise is a Promise. Rico, a Pokémon Poacher, had a Pupitar that evolved into a Tyranitar in A Poached Ego!. EP220 Pupitar Ash's Pokédex Pupitar, the Hard Shell Pokémon. Pupitar is encased in a nearly indestructible shell and has enough power to topple a mountain. 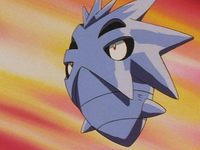 Pupitar first appeared in one of Lance's flashbacks in Popular Pupitar, where he first encountered Silver. He switched out Pupitar to counter the Pursuit from Silver's Murkrow. Another Pupitar appeared in The Last Battle XIII as one of the Pokémon sent to help the fight in Ilex Forest. A Pupitar appeared in Red's fantasy in The Great Helper!!. Pokémon Ranger: Billy uses a Pupitar to back up his Tyranitar. It will not stay still, even while it's a pupa. It already has arms and legs under its solid shell. Pupitar composes a gas inside its body that it compresses and forcefully ejects to propel itself like a jet. The body is very durable - it avoids damage even if it hits solid steel. A Pupitar composes a gas inside its body that it ejects under compression to propel itself like a jet. Its body can withstand a collision with solid steel. Pupitar composes a gas inside its body that it compresses and forcefully ejects to propel itself like a jet. The body is very durable--it avoids damage even if it hits solid steel. Moves marked with a superscript game abbreviation can only be bred onto Pupitar in that game. 51%-100% HP I'm in a pupal stage, but I can jump around. No problem! 26%-50% HP Listen, my HP is down about halfway now. Level up I leveled up! My shell grew even harder, too! 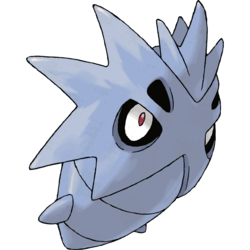 Pupitar tackles with its spiky body and makes numerous rocks tumble down. It leaps around incredibly quickly while ramming to attack. 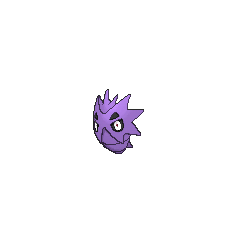 For other sprites and images, please see Pupitar images on the Bulbagarden Archives. Pupitar is only Pokémon that undergoes metamorphosis-like evolution whose Defense base stat is not higher than its Attack. Instead, its Attack base stat is its highest stat. Pupitar is based on a pupa, as it is between its evolutionary line's larval stage (Larvitar) and adulthood (Tyranitar). Pupitar is derived from pupa, the stage in some insects between the larval stage and adulthood. Sanagiras may be a combination of 蛹 sanagi (pupa) and 嫌い kirai (hate). Giras may derive from Gojira, the Japanese name for the character Godzilla, or Angiras, the Japanese name for the character Anguirus. Both are dinosaur-like tokusatsu movie monsters (kaiju) that share some characteristics with Tyranitar, its evolution. Korean 데기라스 Degiras From 번데기 beondegi and Angiras.